What is happiness? For centuries, people have searched for happiness in their lives. Searching, as though it is something to be purchased with bills, or found with a “perfect” spouse, children, or job. In America, Hollywood movies and Disney’s concept of “happily ever after” are engrained in our minds as an attainable happiness that is just out of our grasp. Maybe if we work a little bit harder… maybe if our house was just a little bit bigger… maybe if we lost 20 pounds… the list goes on and on. For the past 7 months, I lived with and taught students at a school in Indonesia who come from impoverished backgrounds. I witnessed the abounding happiness of the students at my school. I was a Fulbright ETA placed at SMA Unggulan CT Foundation (CTF) in Medan, Indonesia. “CT” stands for Chairul Tanjung, who started the school four years ago. Chairul Tanjung is currently the sixth richest man in Indonesia[i], and he developed a desire to start CTF school in the aftermath of the 2004 tsunami that destroyed much of Aceh, in the North Sumatra region of Indonesia. Medan, which is located near the border of Aceh, was deemed an ideal location for such a school. Indonesia is the largest predominately Muslim country in the world, with 87% of its population identifying as Muslim. [v] At my school, all students, teachers, and staff are Muslim except for a few part-time tutors and myself. The school’s mission, vision, activities, classes, and scheduling are all molded around Islamic beliefs. Students partake in prayer together five times each day, and have a strong sense of community due to their religious commonality and the school’s commitment to spiritual development. People with strong ties to families and friends are consistently happier than those without social ties[vi]. In the United States, the predominant culture is individualism. The focus is on self, and the belief that hard work must be a personal decision which will benefit oneself. In Indonesia, the predominant culture is collectivism. The focus is on groups, not the individual. Decisions are usually not based purely on one’s individual aspirations, but on the desires of others, and the impact of one’s actions on family members, community, and friends. Because of its collectivist culture, ties are extremely strong between families and friends in Indonesia, which could account for my students’ happiness. A 2005 study by the University of Pennsylvania showed that one of the greatest contributing factors to happiness in life is how much gratitude we show to others. [vii] Perhaps some of you saw the viral You Tube video, “The Science of Happiness – An Experiment in Gratitude” and saw this in action. If not, take a peek as it might inspire you to show some gratitude to those you love. Because the students at CTF come from low-income backgrounds, they are very grateful for the things that they receive during their time at the school. They know the educational opportunities they will receive are a ticket to a better life, and they do not take them for granted. The culture of the school is one of gratitude. I recently received a note from one of my students, which can be seen below. 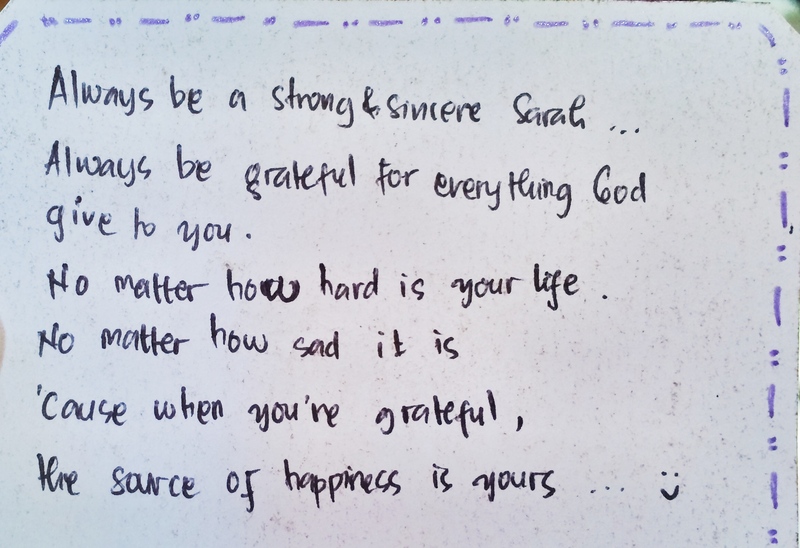 Gratefulness is the foundation for my students’ happiness. Though they have few material possessions and come from impoverished families, they always remain grateful for each other, and those things that cannot be purchased: love, faith, hope, and kindness. A typical day at CTF is full of smiles. Students smile when they greet each other, when they greet their teachers, and they smile consistently throughout classes, meals, and other daily activities. Never before had I ever been surrounded by so many smiles. It is contagious, and I couldn’t help but join in (hence the increased “smile lines” I’ve developed). A 2008 study[ix] found that people who were surrounded by happy people were more likely to become happy in the future. When I first arrived at CTF, I remember being very confused why everyone at the school was happy all the time. In my mind, the weather was hot (and humid beyond my wildest imagination), the bucket bath just never seemed to make me clean, and I was convinced that the insects were slowly taking over the school more and more each day. As much as I hate to admit it, those were the things I was focused on initially. It took me a few weeks before I became more familiar with the environment, and I noticed that happiness was part of the culture of the school. Everyone, whether a student, a maintenance worker, or the kitchen staff, smiled and has a joyfulness about them. CTF is a school with a culture of happiness. According to this study, when you surround yourself with happy people, you are more likely to become happy in the future. This means that CTF is a breeding ground for happy people! In a study conducted at elementary schools in Vancouver,[x] students who performed kind acts experienced significantly higher increases in peer acceptance. In other words, people who are kind to others are more well-liked, which contributes to their own personal happiness as they help other people. Kindness is not a foreign concept at CTF. I cannot count the number of times a student or staff member has shown kindness to me. Whether it has been students bringing porridge to my apartment when I’ve been sick, or teachers taking me out to dinner when I’ve been homesick, I never felt alone at CTF. The concept of “family” really does exist at CTF, and kindness abounds within its community. They look out for each other and they pick each other up when someone falls down. In this brief article, I have mentioned six related factors for happiness, all six of which I found at CTF, my school in Indonesia. The study of positive psychology is far more extensive than the mere links I’ve discussed here; however it’s time we start talking more openly about these issues, even if it’s one at a time. There are many things we can learn from the students at CTF. They may not have money for the latest technology, or they may have even grown up not knowing where their next hot meal would come from, but they are way ahead of Americans when it comes to being happy. They have something that is far more valuable than material goods. They are grateful, kind, and find the positive in their circumstances, sealing it with a smile. In the seven months I spent sharing life with the students at CTF, I learned more from them about living a full and happy life than I ever could have taught them about American culture, or the English language. They have been my teachers, showing me what’s really important in life. They’ve shown me the path to happiness, and we all need to take some time to learn a thing or two from them. [iv] Lim, Chaeyoon and Putnam, Robert. “Religion, Social Networks, and Life Satisfaction.” American Sociological Review 75 (2010): 914-933; Ellison, Christopher et. al. “Does Religious Commitment Contribute to Individual Life Satisfaction?” Social Forces 68, no. 1 (1989): 100-123. [vii] Positive Psychology Progress: Empirical Validation of Interventions. Seligman, Martin E. P.; Steen, Tracy A.; Park, Nansook; Peterson, Christopher. American Psychologist, Vol 60(5), Jul-Aug 2005, 410-421. 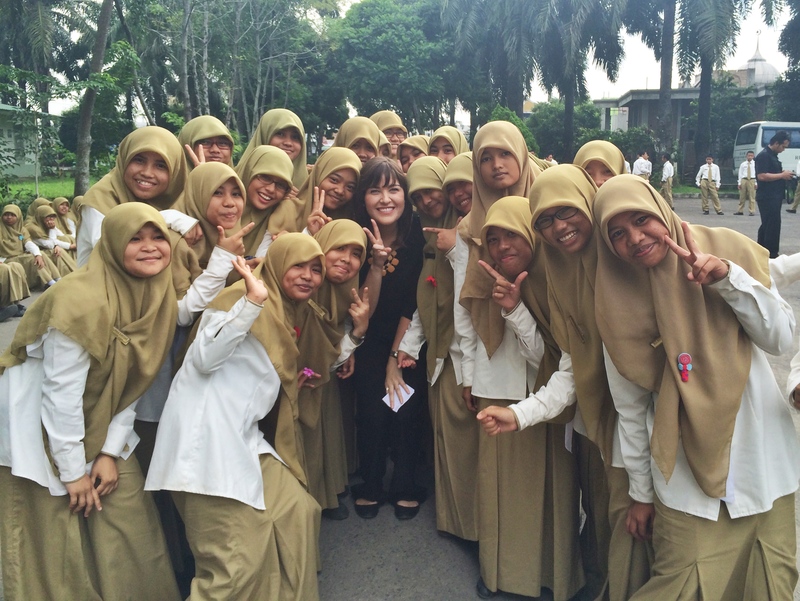 About the author: Sarah McClanahan was a Fulbright English Teaching Assistant in Medan, North Sumatra. She graduated from Iowa State University with her B.A. in Communication Studies and Music, and finished her M.Ed. in Higher Education from the University of South Carolina in 2014. Sarah loves kittens, maps, thunderstorms, and writing music. So touching Sarah.. you are their angel that that God sent to them. You are our inspiring teacher, beloved friend, and our family in a far far away but so close in our heart.